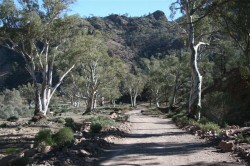 Arrived two days ago to the greenest Flinders Ranges we have ever seen. We have been here three times, the first with carcasses of animals in paddocks and on the road, red dirt on the ground, but strangely enough, the creeks still running. This was 30 odd years ago and we stayed at East Brachina Gorge. This photo of our ‘smalls’ indicates the lengths we had to go to to dry the ‘important bits’!. 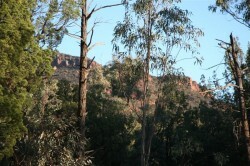 This time, our first night here we stayed on an unpowered site at Wilpena campground and froze our thingees off!! (Especially with aching ribs). The next morning we were over to reception to book in for five nights on a powered site!! Yes, we are getting soft, but at least we are still here. There is a resort and motel, so that could be the next option (only kidding of course). We are starting to love our Kimberley again – a love/hate relationship – love it because it is perfect for what we need, but can we trust it?? 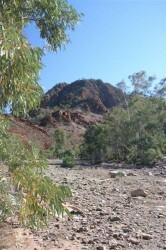 Took it easy the first day, and the next, for that matter, then went up to Brachina Gorge, had a picnic. We followed the ‘Brachina Gorge Geological Trail, informing us, as we travelled, that the various formations of shale, limestone, quartzite, sandstone, etc., all dating back to 560Million+ years!!! Things have changed so much. Everything seems to be bushier, much more shrubs, small trees, maybe five years old, but incredibly different to the extremely dry environment on the past two trips. 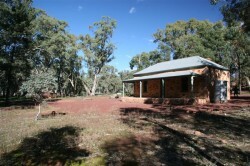 Absolutely wonderful, but with Australia’s drought, we expected a completely different scene. We saw the most spectacular, healthy looking rock wallaby, with a striped tail, that made him look like a Richmond supporter. This morning we walked 7kms into Wilpena Pound to the old homestead – a little bit difficult on the way in (with extra breathing and the ribs), but I thoroughly enjoyed the walk out, on the decline. We found a great place to take a picnic to either tomorrow or the next day, which is only about 3.5 kms in. There are a lot of rules and regulations here, one of which is that you can’t ride your bikes into this ideal spot. Quite ridiculous, as the walking path is road width and a shuttle bus uses it! Our photos haven’t quite captured the magnificent colours of the rocks and the intensity of the green, so put your imaginary colour-receptor goggles on and let your imagination do the work. 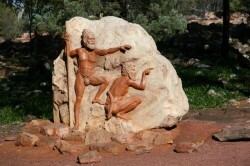 The sculptures in the photo show you the way to Wangara Lookout, giving you a magnicent view of the Wilpena Pound.